Tiles and Diamonds. Two new shapes! 5 square tiles about 14-16mm square. Give or take a couple of mm. The diamonds are about 12 mm. The set is a transparent dark brown with black decorations on the tiles. The diamonds a simply transparent dark brown. Price:$24 for the set. 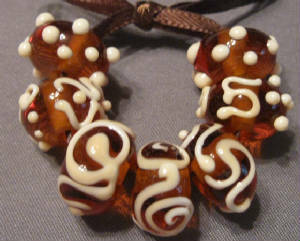 "Rootbeer & creme" Transparent root beer brown cake beads decorated with opaque ivory. The beads measure about 12 mm each. 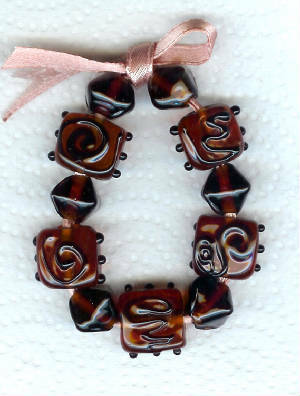 PRICE: $10.00 for the set of 7 beads.